Gamelyn Games will release Tiny Epic Defenders 2nd Edition and its expansion The Dark War to trade on August 1, with Tiny Epic Zombies shambling out on Halloween day. 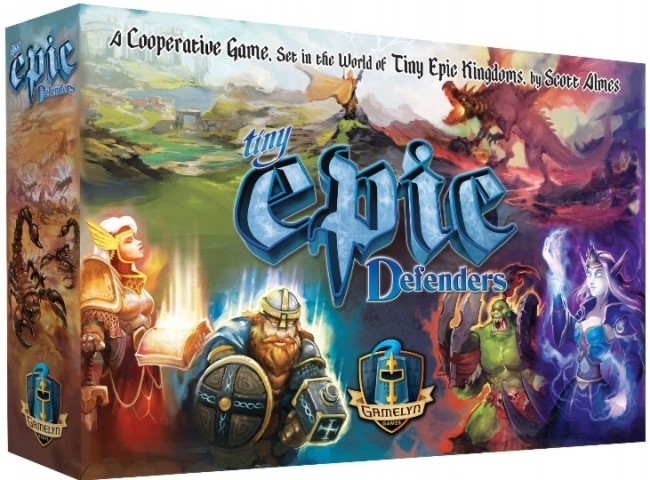 An updated version of 2015�s Tiny Epic Defenders, the Tiny Epic Defenders 2nd Edition is a cooperative game created in Scott Almes� now-iconic small format. Set in the fantasy world of Aughmoore, the game challenges players to protect the last remnants of a world overrun by a terrible evil. They must defend the Capital City from waves of monsters long enough to face the Epic Foe. To win the game, the Epic Foe must be defeated. The new edition of the game features upgraded components and artwork, �ITEMeeples� that can be fitted with gear, and new mechanics that give players more control over events in the game. The game comes with 4 ITEMeeples, 12 wooden tokens, 10 Artifact Items, and 54 cards. Tiny Epic Defenders is designed fro 1 to 4 players, ages 14 and up, and takes about 45 minutes to play. MSRP is $25.00. The expansion, The Dark War, adds new playable characters, new Epic Foes, and new Artifacts. It also introduces a campaign feature, where players can play a series of linked games, building up to a final climactic battle. The expansion also features 3D playing pieces: caravan wagons, a tree, and a manticore that ITEMeeples can ride in. The Dark War includes 6 caravans, 3 fleet dice with boat tokens, 5 wood death tokens, 3 sandstorm tokens, 1 3D tree, 1 3D Manticore, 62 cards, and 6 Artifact Items. As an expansion, a copy of the base game is needed to play. MSRP is $25.00. 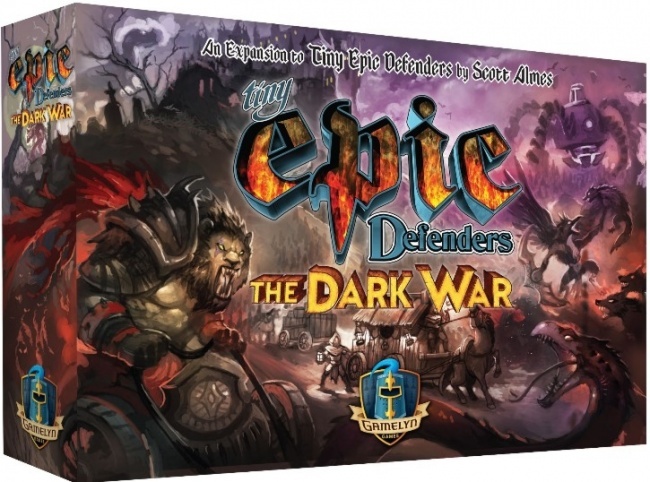 Gamelyn funded the production of Tiny Epic Defenders 2nd Edition and The Dark War expansion through a Kickstarter campaign last October that attracted 6,966 backers to pledge $379,029 (an average of $54.41 per backer). Announced earlier this year, Tiny Epic Zombies puts a survival horror theme on the Tiny Epic experience (see ��Tiny Epic� Game Takes on Survival Horror Genre�), using ITEMeeples to represent the survivors against a tiny horde of wooden zombie tokens. This game offers multiple playing modes, including cooperative, competitive, and overlord style play. 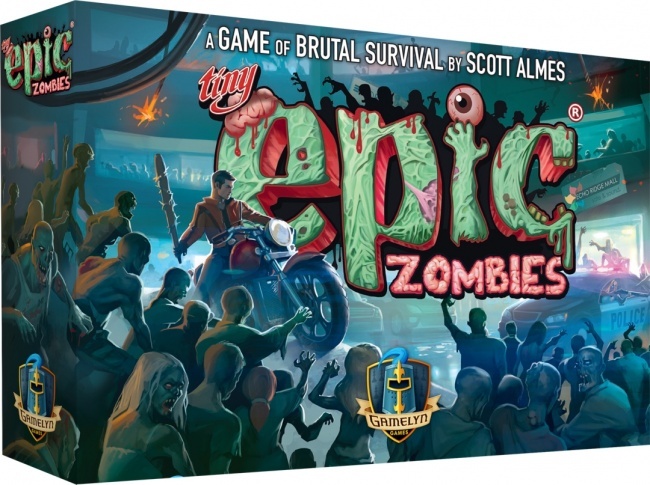 Tiny Epic Zombies will release on October 31 with an MSRP of $25.00. The Kickstarter campaign to fund this game ultimately brought in $854,483 in pledged support from 23,425 backers (an average of $36.48 per backer).